Technology is continually evolving. Bringing us faster, more user friendly and useful tools into our lives. USB-C (also known as USB Type-C) is the next evolution of cable connectivity for your notebook, phone, tablet and other portable technology device. Here you can learn more about the latest in tablet USB-C connectivity. USB-C was developed by the USB Implementers' Forum (USB-IF). The industry body that seeks to improve the use of USB. The body includes some of the industry’s biggest players including Apple, Dell, Intel, Microsoft, Samsung and others. With backing from such industry greats it is without doubt that USB-C will become the one standard in cable connection. As such our devices will benefit from the great features that USB-C has to offer. USB-C is not only a change in shape from the standard USB-A and B shapes, it offers faster transfer speeds, a thinner and reversible profile and power through support to name a few. USB-C 3.1 (Gen 2) supports up to a massive 10Gb/s file transfer speed. This means you can transfer a whole movie or music album in less than 30 seconds. In addition to fast file transfer speeds the connection will also allow up to 20 volts and 5 amps of power (up to 100Watts). Meaning faster charge times for your devices. With enough power to charge a notebook as well as a monitor, printer or other peripherals. USB-C allows video streaming of 4K video files. 4K is one of the highest video resolutions available to consumers at the moment. You can connect your USB-C notebook up to your 4K supported monitor, to view 4K content. USB-C also supports audio/video output, including HDMI®, VGA, and DisplayPort™ displays (using a separate adaptor). With USB-C, just one cable or power source could potentially power all your USB-C devices. USB-C is reversible. Meaning it doesn't matter which way you insert it into your device. There is no up or down so it does not matter which way you plug it in. USB-C cables will work in all other USB-C devices no matter which brand of device you use. It will work with all operating systems. Windows, Mac, Android, Linux or others. A more compact connection means that manufacturers can create thinner and more streamlined devices. What does a USB C Cable look like? USB-C connections are smaller than the current standard USB-A head and slightly larger than a USB-A Micro head. What can the USB-C cable be used for? USB-C is being adopted by a large list of technology providers. Most notably the Apple Macbook, but also Tablet and Notebook manufacturers such as Asus, Acer, Dell, Lenovo and others. As well as mobile phone manufacturers. While you might be purchasing a USB-C compatible device don’t worry you can still use all your old USB-A cables. You will need however, an adapter. Laser offers a range of adapters for all your USB needs. Connect your USB-A cable up to your new USB-C compatible device with one of these adapters and you are ready to go. USB-C is not the same as USB 3.1. They were developed at the same time however they relate to different aspects of USB. USB 3.1 refers to the generation of USB and the data transfer speed. 3.1 is currently and fastest generation of USB. USB-C simply refers to the connector shape. The SuperSpeed USB offers data transfer up to 10Gbps (USB 3.1 Gen 1 up to 5Gbps and Gen 2 up to 10Gbps) via a more efficient data encoding system and will deliver more than twice the effective data through-put performance of existing SuperSpeed USB devices. USB-C has the ability to pass up to 100 Watts (Gen 2) of power through the cable. As many new USB-C portable devices only have this one port, this means that your USB-C port will be used not only to transfer data but also for charging your device. It can also be used to transfer power from your device to charge or a peripheral device, such as a printer. The new standard in USB connectivity is a cable that not only transfers data, but also power. As we all know when there is power involved you must consider the quality of product you are purchasing. We all spend a lot of money on our portable devices and store priceless information on them. Laser sources only the highest quality cables to ensure safety and security. Don’t purchase second rate cables and adapters. With over 28 years in Consumer Electronics, Laser is an Australian household brand that you can trust. 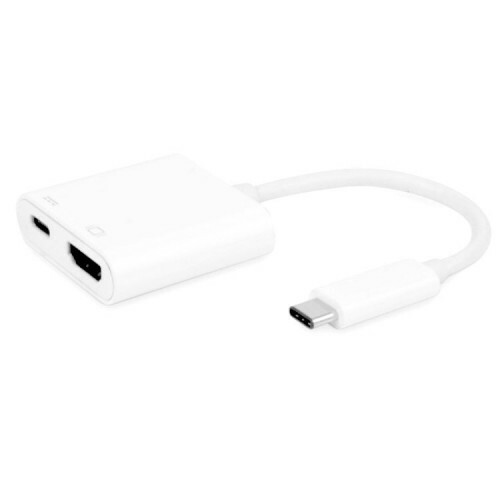 The USB-C Digital AV Multiport Adapter lets you connect your MacBook with USB-C port to a HDMI display, while also connecting a USB-C charging cable. This adapter allows you to mirror your MacBook display to your HDMI-enabled TV or display in up to 1080p at 60Hz or UHD (3840x2160) at 30Hz. It also outputs video content like films and captured video. Simply connect the adapter to the USB-C port on your MacBook and then to your TV or projector via an HDMI cable (sold separately). You can also connect a charging cable to the USB-C port to charge your MacBook.